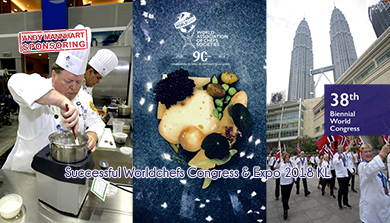 From 11th to 14th July 2018 more than 1000 Chefs from all over the world gathered for the 38th biennial Worldchefs Congress – hosted this year by the Malaysian Chefs Association in vibrant Kuala Lumpur in its 90th year. Thomas Gugler, Worldchefs President, Andy Cuthbert, Worldchefs Congress Chairman and Ragnar Fridriksson, Worldchefs Managing Director and their teams managed once again to put a comprehensive program together from trendy educational and ecological congress subjects to a high class competition and networking opportunities. All this perfectly “embedded” in the heart of Kuala Lumpur, the KLCC (Kuala Lumpur Convention Center), coupled with magnificent gardens and iconic Petronas Towers just across. Andy Mannhart as Worldchefs program partner is proud to have sponsored the kitchen utensils for the 10 competition kitchens for the Global Chefs Challenge. Russia here we come: the Worldchefs Congress 2020 will take place in St. Petersburg, Russia. See you there in July 2020.